Vero Beach,FL -- It's about 8 p.m. and I'm settled in a Howard Johnson motel on US 1 only two miles or so from the Atlantic Ocean. I hope to be on the road at 4 a.m. for a quick ride to the ocean, a ceremonial dip in the ocean waters and a prayer for Bill Fox. Then, I'll turn the bike west and start biking for Tampa, Clearwater Beach and the Gulf of Mexico -- some 170+ miles away. 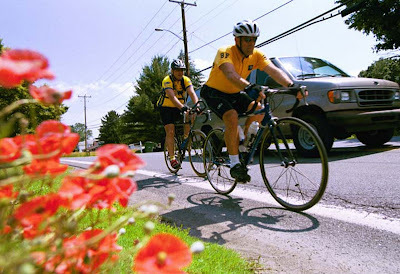 It's a day to honor the memory of Bill Fox, a long-distance bicyclist who died June 1, 2002, six years ago, in the mid-Hudson Valley about 60 miles north of New York City. The weather looks ideal for June 1 -- pleasant winds off the ocean from the east and south that should serve as tailwinds pushing me toward the Tampa Bay area. There's a small chance for an isolated shower and the temps should hit the 90s by late morning. But overall, it looks like a toasty and clear day to bike. I'm looking forward to meeting Steve Swiger, my SAG-man, about 35-40 miles into the journey in Yeehaw Junction. Steve has a laptop, so I'll be blogging along the Ocean2Gulf Bill Fox ride Sunday. Many thanks to fellow Tampa cyclist Ellen Pierson, who drive with me and her mom to Vero Beach. Ellen and I left Tampa about 11 a.m. and picked up her mom Ruthie at their Orlando house and then we headed to Vero Beach. But not before we pulled over at a park in Sebastian, FL to view the shuttle blastoff from Capa Caneveral about 50 miles to the north at 5:03 pm. We shared a wonderful dinner at a grill restaurant on the ocean in Vero Beach, before Ellen wished me well and dropped me off at the Howard Johnson inn. You might recall that Ellen is the local Tampa ringleader for the Police Unity Tour, a fundraiser bike ride of law enforcement staffers from around the country to raise money to build a law enforcement memorial in Washington,D.C. It's a good cause and I'm happy to support Ellen's efforts. I'll be up early Sunday. See you tomorrow on the road. This afternoon I had the chance to talk with Margaret Fox, a kind-hearted woman who lives outside Middletown, NY in the Hudson Valley. Margaret lost her husband six years ago on Sunday when Bill Fox, an experienced long-distance bicyclist, crashed and died in a bike accident in the Hudson Valley. This weekend, she said, was particularly tough given the loss of her husband's life six years ago. What gives her a smile, though,is that Margaret is a new grandmother again, as her son and daughter-in-law just had a daughter a week ago. Her son Roland, and his wife, had a boy three years ago. Margaret appreciated the Ocean2Gulf Bike Ride that I'm doing on Sunday, along with the efforts of friends who will be helping me along the way. I always wanted to bike across the state in one day from Vero Beach to Clearwater Beach and see the savannah-like terrain of Florida along State Road 60 in the middle of the state. Bill Fox was a long-distance cyclist, too, who loved to share his infectious love for bicycling with anyone who would listen. He turned out to be a kindred spirit and I'm proud to bike in his memory on Sunday. I think Bill would be proud, and I'm proud to carry on his legacy and love for bicycling. This blog will have reports and photos throughout the day on Sunday. Steve Swiger will be providing vehicle support and also sharing in the writing, photography and blogging throughout the day with me. This fella lives right on my street and I caught up with him as he was pedaling to the good ol' Fun-Lan market. Check out that front carrying box on the handlebar. Old school. If you live in the Lake Roberta area in Seminole Heights, you know that Idlewild Avenue is a cut-through fopr drivers who go from Nebraska Avenue and Public to 22nd Street and points east in Tampa. This morning I noticed a police mph machine recording speeds. I hope it slows down the traffic. Ellen Pierson sends over a terrific one-stop shopping web site of bicycle site links. On Sunday, I'll be pedaling State Road 60. The whole way. From the Atlantic to the Gulf. Here is the very, very approximate time schedule for the route. Not enough thanks to Steve Swiger, who will be providing SAG and a laptop so that I can post reports throughout the during the bike ride in memory of Bill Fox. I don't know if you've noticed, but there are more people waiting at bus stops to use the bus and even people hopping on bicycles. Law enforcement on bicycles is not too new. And, plus we had a strong contingent of law enforcement folks on bicycles for the recent Police Unity Tour. It's not a bike shop. It's Steve Swiger's bicycle storage/IT-computer nerve center room that is as big as your rich Aunt Martha's closet. Steve is a member of the Seminole Heights Bicycle Club's core-steering committee and helped put on the debut of the Bike-in Movie Theater on May 17. Steve is also helping me with my memorial Ocean2Gulf Bike Ride in memory of Bill Fox on Sunday June 1 by providing SAG support. If you would like to help with Steve, feel free to email me. 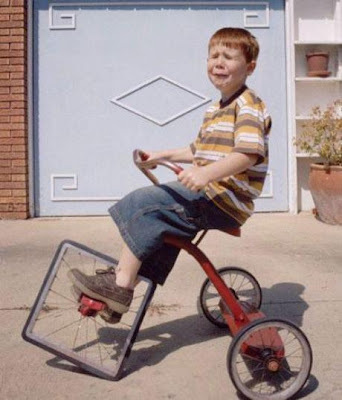 This is one bike that didn't quite make Steve's storage room. You might recall this rig from a previous SHBC ride. One week from today I will be cycling on State Road 60 crossing the state of Florida on a coast-to-coast one-day solo bicycle ride in memory of Bill Fox, a long-distance bicyclist who died in a bike accident in the Fishkill, NY area six years ago next Sunday. You will be able to track this ride next Sunday, which I estimate in the 170-175 mile range, on this blog thanks to Steve Swiger. Steve will be providing SAG services, including a laptop computer which will be hooked into his cell phone to provide blogging and photos during the actual ride. I plan to stick my front wheel into the Atlantic Ocean at 4:30AM in Vero Beach, turn west and start pedaling for Clearwater Beach, which I hope to reach around 8 PM. I will be wearing this bike jersey on June 1, when I bike in the memory of Middletown, NY cyclist Bill Fox from Vero Beach to Clearwater Beach. 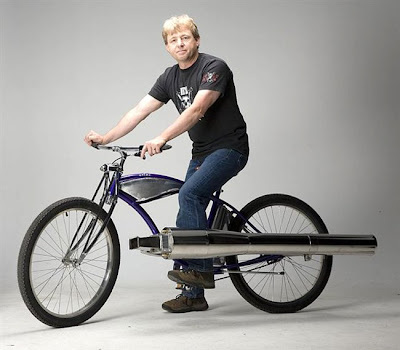 Yahoo was running this story tonight from a Wired blog about a jet-powered bicycle. Look for the "chili peddler" item. Lake Roberta looke serene right after the sun set Tuesday. Another nice way to end a bike ride. The travelling revival hit town today when the Barack Obama Tour paid a visit to the local hockey arena that's named after the newspaper across The Bay. Obama dazzled the crowd. It was a novelty to hear a guy who could be president of the United States talk so well when you consider the current Commander-in-Chief can hardly utter a grammatically-correct sentence. The crowd was frenzied. And in contrast to what some of the media was saying, the joint was not completely filled. The arena's bottom bowl and the suite level were indeed packed, but the upper level was mostly empty. For a region that's a little behind the times and just a tad conservative, it was fun to see the charismatic O-Train Express zoom into town and captivate the masses. It was the stuff of an evangelical preacher mesmerizing a crowd that chanted, waved signs and was completely captivated. I was there with fellow Seminole Heights Bicycle Club member Steve Swiger. We biked to the Forum and joined the 15,000 or so folks. As you can see, the O-Man was in the house. Congressman Robert Wexler from Boca Raton and our own Congresswoman from Tampa -- Kathy Castor -- it seemed like yesterday when she was battling Ronda Storms on the Hillsborough County Commission -- introduced the O-Man. Mayor Pam helped pump up the crowd. 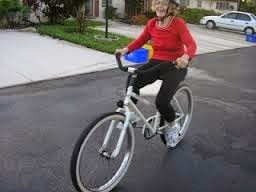 She biked with the Seminole Heights Bicycle Club and promised to stripe a bike lane on Platt Street. Concessions stands were ringing up sales. The media was interviewing anything that was moving. This fella won the "Mr. Dapper" award. On Tuesday afternoon, Ellen Snelling of the Tampa Alcohol Coalition accepted a $5,000 donation from the Seminole Hard Rock Cafe to work on projects to stop drunk driving and alcohol abuse. On June 1, I plan to bike 170 miles from the Atlantic Coast at Vero Beach to the Gulf Coast at Clearwater Beach to remember the inspiring bicycle life of the amazing Bill Fox. Remarkably, I met Bill a single time -- in April 2001 when I was biking a crazy 115-mile route in the Hudson Valley in NY state as part of a goofy newspaper business story on the Stewart's convenience store chain. I had a chance meeting with Bill at a Stewart's store in Goshen. Bill was biking from Middletown, NY into New York City to catch a concert and I was on my zany bike Tour de Stewart's for the story for a daily newspaper called the Middletown, NY-based Times Herald-Record. Bill and I were both long-distance marathon cyclists who used our bicycles as much as vehicles of meditation as we did as machines that carried us hundreds of miles. So he was a kindred spirit. We both loved sharing our infectious love of bicycling with anyone willing to listen. We were cycling evangelists. The un-saved people called us bicycle enthusiasts. I included Bill in that Tour de Stewart's newspaper story in 2001. The next time I wrote about Bill was when I wrote a newspaper story about his death in June 2002. I saw an obit in my newspaper of a "Bill Fox" on the Times Herald-Record and the obit included a line about his love for bicycling. Not knowing that this was the same Bill Fox I met a year earlier at that Stewart's store during our bike rides, I interviewed's Bill's wife and wrote a story about Bill. It was during the interview that Margaret Fox, Bill's wife, informed me that Bill enjoyed meeting me during the bike rides one year earlier and he actually kept the story after it ran in the Times Herald-Record. Margaret had triggered my memory -- yes, her husband was Bill Fox, the amazing Bill Fox who I met a year earlier during that Stewart's store ride. 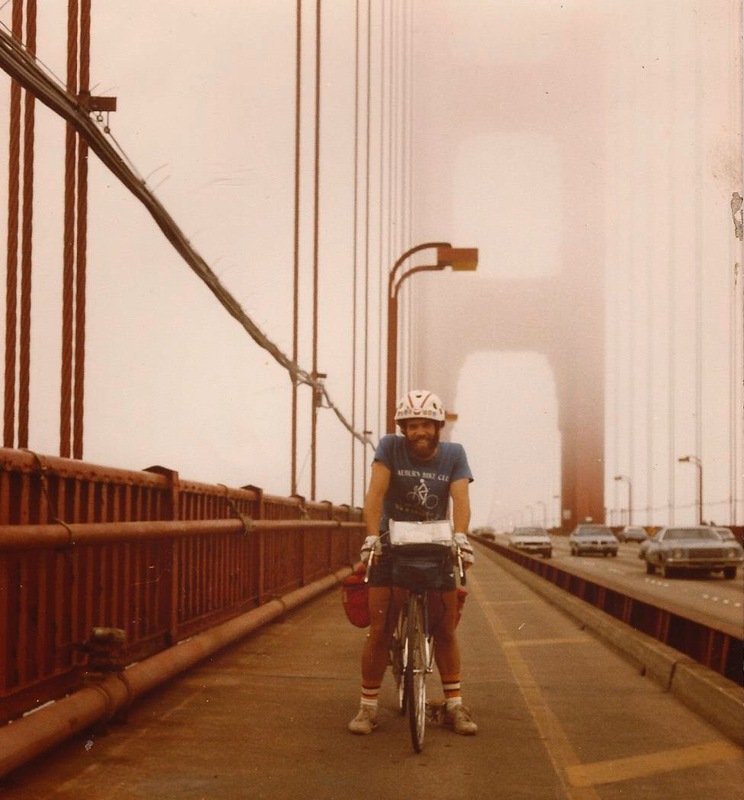 Three years after Bill's death, I did a personal memorial bicycle ride for Bill by biking 158 miles from the George Washington Bridge at New York City to the state capitol in Albany. Along the way, I phoned in messages to amazing blogger Jeff Houck, who posted live reports about the 158-mile Bill Fox ride on his Side Salad blog. 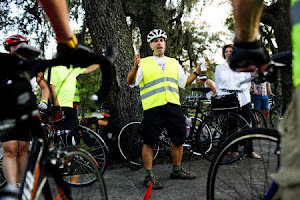 I also wrote a story about that 158-mile ride in Bill's memory for the Tampa Tribune. Jeff also had a hand in that, being that Jeff was the travel editor at the Tribune at the time. Jeff did a masterful job editing the story. I had dinner with Margaret Fox while I was visiting the Hudson Valley for the bike ride in her husband's memory. A few weeks later, a package came in the mail. It was a former jersey of Bill's. I wear it only one time a year -- when I do my annual bike around Lake Okeechobee 120-mile ride. I was amazingly touched by Margaret's gesture. So many people joined the ride in different ways. Take my Hudson Valley pal, Wayne Hall, who I met along the way. Chris O'Connell, another Hudson Valley friend, rode 80 of the 158 miles with me. 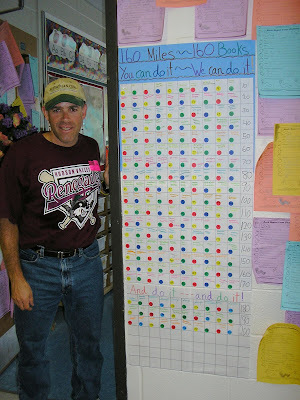 And my Hudson Valley teacher-friend Rosemary Evans even had her second-grade class read 160 books for each of the 160 miles of the bike ride. 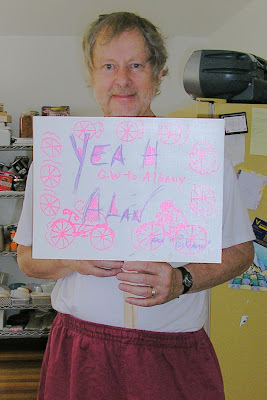 The support and love along the way for that Hudson Valley bike ride would have made Bill proud. 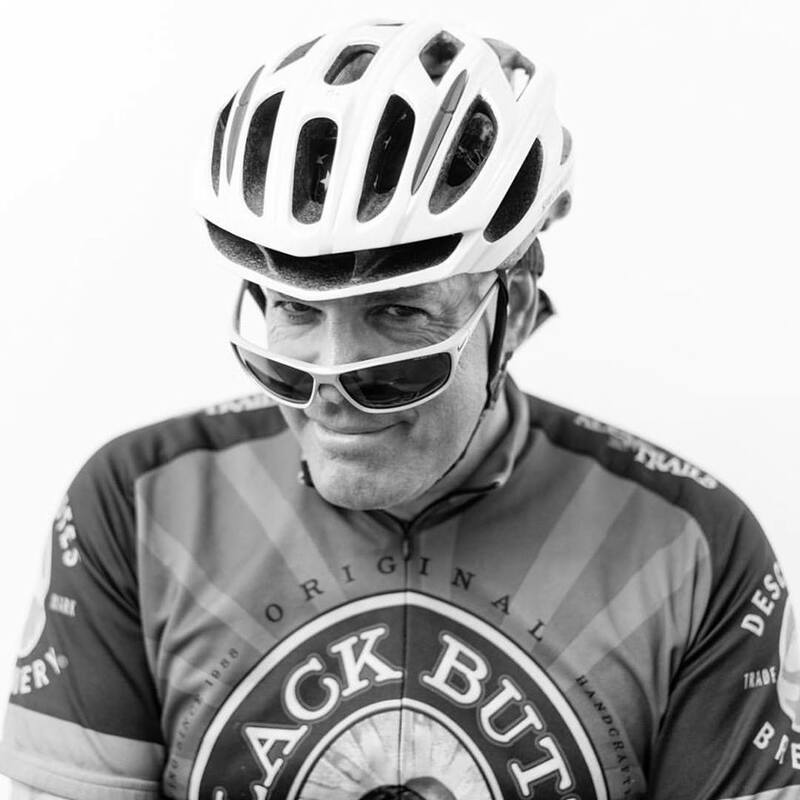 So this June 1 will be six years since the amazing Bill Fox died -- and I plan to remember Bill and his legacy of his love for cycling again with another bike ride. I can't bike in New York in June. But I can bike in my adopted state of Florida. I plan to respect Bill's bicycling spirit by pedaling 170 miles from the Atlantic Ocean in Vero Beach to the Gulf of Mexico in Clearwater Beach. The route will be ultra-simple: State Road 60 coast-to-coast. Until now, I've mentioned this to only a few people and already I have been touched by the offers of help. Steve Swiger, a fellow Seminole Heights Bicycle Club member, has already offered to sag, while another SHBC memner, Ken Sturrock, has offered to pick me up in Clearwater Beach. I'm happy to share the ride in Bill's memory with anyone who wants to participate in any way. I'm biking SR 60 the whole way. This lady was looking for her lost beagle this morning on Bruce B. Downs. Bicycling comes in all forms -- sure, you have the speedy roadie guys. But there are hybrids bikers and mountain bikers and folks who pedal fat-tire cruisers and BMXers and well, you get the point. Which brings me to baseball. The Major League Baseball stuff you see on TV is just one form of baseball. It comes in all types -- like today when I was cycling home from Flatwoods and came upon a ballgame at the Rowlett Park in Sulphur Springs. I found watching these Rays more fascinating than the big-league version. The Other Shoe Fell -- Or Another 10,000 Miles. Another day, another road bike, another odometer turning over 10,000 miles. This odometer was installed in December 2006 and rolled over from 9999 to 10,000 on the Hillsborough River bridge on Morris Bridge Road as I biked home from Flatwoods county park this norning. This odometer is on my Trek 5200. I rolled over to 10,000 miles just the other day on my Trek 2200 road bike. That odometer was installed in November 2006. Tonight the Seminole Heights Bicycle Club held the inaugural Bike-in Movie Theater in my back yard and 30 cyclists showed up on a Saturday night to share a potluck dinner and a wonderful movie, the 1979 classic Breaking Away. It's amazing -- just four months ago we were organizing this bike club on my front porch and now we're having regular Saturday morning rides and drawing crowds to events like the Bike-in Movie Theater. Tonight, SHBC member Steve Swiger was the technical genius behind using a projector provided by Ken Sturrock and Mike and Yvon Limerick set up the screen and brought a ton of items to make the night a success. David from WMNF came and interviewed Mike about tonight's Bike-in Movie Theater. Steve was a master whiz on the tech angle of putting the movie on, while Yvon did a terrific job preparing "goodie bags" of snacks and popcorn for everyone. They, along with Mike, made it all happen. The movie was well received. Jack Sweeney showed up with the best T-shirt of the night -- the official "Cutters' garb worn by the Bloomington Four who won the Little 500 Bicycle Race at the University of Indiana. Jack, the famed bike-commuting Ghost Rider, came with his pot luck dinner contribution firmly secure and nestled in his trailer. Check out the straps holding the pot of chili in place. Jennifer and Lisa flank Tanja and Tanja's traveling pal, Chiquita. But I'd give Chiquita a little doggie helmet. Earlier in the day, Mike Limerick led an abreviated version of our 22-mile "Long" ride, as we had to turn around after about six miles because of a bad rainstorm and more rain clouds coming our way. Sometimes I know the feeling kid. My pal Willie Drye from Plymouth, NC sent me this edoitorial about nicycling in North Carolina. Sounds awfully familiar. A rash of car-bicycle accidents in the Triangle is a reminder that North Carolina's road-building standards make leisure or gas-saving bike riding risky at best and deadly at worst. At a time when biking to work or from there to a restaurant at lunchtime could save real money -- and when North Carolinians suffer from an epidemic of obesity -- it seems that the Department of Transportation would be paying extra attention to making state roadways cyclist-friendly. Bicycling list serves are buzzing about the death last month of Nancy Antoine Leidy, killed when a young man, allegedly driving drunk, plowed into her bike in west Raleigh. A few days later, a woman biking with her husband in Durham County was hit from behind and landed in the hospital in intensive care. The 83-year-old driver was cited for failing to control her speed in the accident that injured Wendy Savage. Such incidents are not uncommon. A bike-motor vehicle accident resulting in injuries occurs about 900 times a year in North Carolina. In 2006, 20 North Carolinians died in bicycle accidents on the road. Wider roads with built-in bike lanes or shoulders that could accommodate cyclists would reduce significantly the number of accidents, and those features need to be included when roads are repaved. A state highway safety committee said as much during meetings last year, where it was reported that "edge drop offs/shoulder crumble/rutting" and "narrow lanes and shoulders" were the cause of too many auto accidents. Those deficiencies make using the roads to safely ride bikes nearly impossible. Many people who want to save money and who know the value of exercise would ride bikes more often but don't do so out of fear. Many workers in job centers such as the universities, Research Triangle Park and downtown Raleigh are among likely bike commuters if conditions were improved. Certainly the state needs to provide more education, to drivers and cyclists, about the laws and etiquette of the road. But if North Carolina is to remain the good-roads state in the 21st century, it should do it right and design its roads for both motor and pedal traffic. This morning I biked in to Tampa with bicycle commuter Rob Keith, vice president of corporate sponsorships at the Tampa Bay Lightning. Rob used to bike commute when he lived in Portland. These days he lives in the Carrollwood area just west of the Babe Zaharias Golf Course and doesn't bike into downtown Tampa, sticking mostly to biking around the sprawling golf course just west of North Boulevard. I biked some six miles to Rob's house, then biked in the 10 miles it takes to reach the Forum, and Rob's office. There was some dicey stretches along Sligh Avenue and North Blvd. and I wanted to help guide Rob safely into downtown Tampa. We followed the Tampa Street bike lane right into downtown Tampa. Rob and his chariot in his office. He keeps the bike inside his office. All employers should allow their workers to keep their bikes next to their desks. 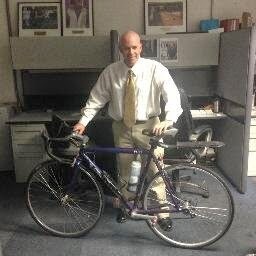 While I was the Forum, I popped in on Ron Campbell, the Lightning president who biked to work from his south Tampa house on Wednesday. It's Bike Month and Bike to Work Week and Bike to Work Day, nice titles that offer the media what editors call a "news hook" to cover the subject. And the stories have been popping all week. I lived in Denver and used to bike to my job at the Denver Post, so I know the city is a very bicycle-friendly. That's why this story is very consistent with the bicycle scene in Denver. I was cycling home from Flatwoods this morning when the odometer on my Trek 2200 road bike turned over from 9999 to . . .
10000. That's 10,000 miles since November 2006. Oh, the odometer on my other road bike, the Trek 5200? That's about to hit 10,000 tomorrow. That odometer was installed in December 2006. I'm thankful for all those miles and the health I have enjoyed while logging every mile. In its June issue, Bicycling magazine names the best American cities for cycling. Portland, Oregon, Chicago, Seattle, San Francisco and Boulder snagged the top spots as America's overall best but especially notable on this year's list is Boston ranking in the "5 for the Future" category; Boston has been a recurring fixture on Bicycling's "Worst Cities for Cycling" list for the past three years. Central to Boston's noteworthy move is mayor Thomas Menino's newfound love of cycling. After getting hooked on his new Trek Lime, Menino hired former Olympic cyclist Nicole Freedman to serve as Boston's bike coordinator; a position the city had eliminated in 2003. The pair is working on the first significant cycling-friendly development since then: 5-foot-wide bike lanes extending along Commonwealth Avenue. "Bicycling's Best Cities list this year proves that great things can happen in short periods of time, even in the largest metropolitan areas," said Steve Madden, Editor-in-Chief of Bicycling. "Watching a city like Boston turn its city cycling plans into reality has been an incredibly gratifying process for us. It's evidence that a much needed, far reaching pro-cycling movement is in the works." To compile the list, Bicycling editors started with a list of more than 250 cities and narrowed it down using the following factors: cycling-friendly statistics (numbers of bike lanes and routes, bike racks, city projects completed and planned) including changes in these statistics and a city's future plans since the last survey; bike culture (number of bike commuters, cycling clubs, cycling events, renowned bike shops); and a survey of experts at national bicycle groups such as the League of American Bicyclists, Bikes Belong, the Thunderhead Alliance and the International Mountain Biking Association (IMBA). As for the worst American cities for cycling, Bicycling pointed to Dallas, TX; Memphis, Tennessee; and Miami, FL; all of which are devoid of bike lanes, and ruled by cars. Internationally, Amsterdam snagged the top spot as the best foreign city to visit by bike. Additional winners are: Copenhagen, Denmark; Melbourne, Australia; Montreal, Canada; Bogota, Columbia; Paris, France; Barcelona, Spain; and Berlin, Germany. May is Bike Month and this week is Bike to Work Week and Friday is Bike to Work Day -- so you'll be seeing the media covering folks who are biking to work. Like our own Mike Limerick of the Seminole Heights Bicycle Club. Mike is a terrific bicycle guy who bikes a couple of times a week from our neighborhood here in Seminole Heights to his physical training job at Telecom Park off Fletcher Avenue. Ghostrider/Tampa superbikecommuter Jack Sweeney informs me that this lovely bicycle used by his wife has been stolen from the parking garage at the Tampa General Hospital. Remarkably, six or seven bikes have been stolen right from under the noses of two parking lot attendants whose booths are right next to the bike rack while a security camera is focused on a blank wall and not the bike rack despite the bike thefts during the past few weeks. So, be on the lookout for this bicycle. 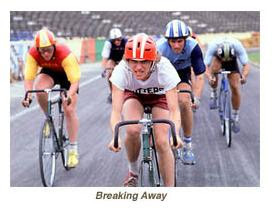 Breaking Away is a beautifully written and hilarious movie about four guys who just graduated high school in Bloomington, Indiana, including one cycling fella who has been bitten by the Italian racing bug. Yes, it's a coming-of-age movie -- and it's sweetly written and marvelously acted. The movie came out in 1979 -- and it's the one movie I have watched the most times. It served as the venue for the big-screen debuts of Dennis Quaid and Daniel Stern -- and the screenwriting has withstood the test of time. The screenwriter was a guy by the name of Steve Tesich -- and he won Oscar for the screenplay. Yes, it was that good -- and still is. 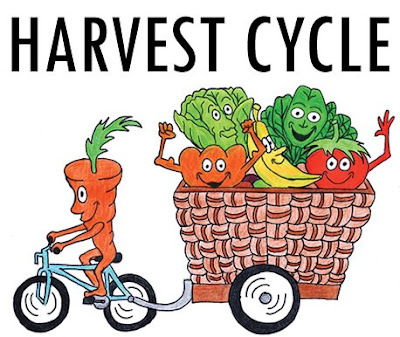 So, the Seminole Heights Bicycle Club is holding a Bike-in Movie Theater event on Saturday at my place, 1203 East Powhatan Ave. Potluck dinner is at 8 PM and the movie will be shown at 9 PM in the back yard. And you're invited. You'll love the movie. Four guys, the townies, become the Cutters team and they take on the boys at the University of Indiana in a Little 500 bicycle race. And, well, you just have to watch it. There's so much more plotlines woven into the script. 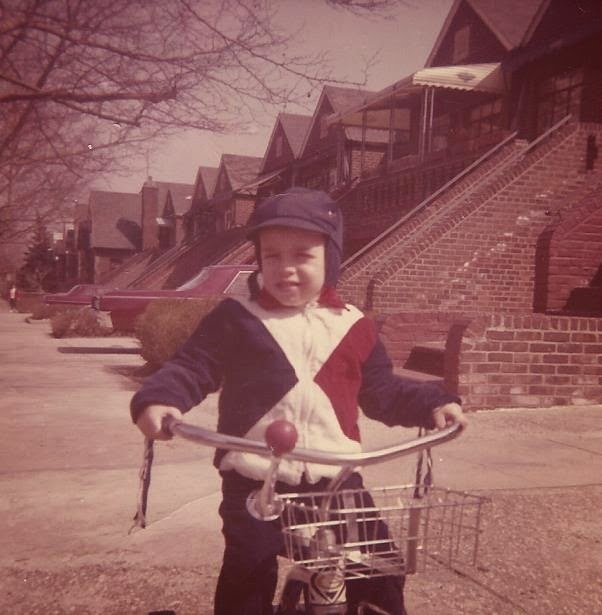 For a clip of the movie check out Adam Newman's post on his St. Pete Times bicycle blog. Bill Addler, owner of SWFBUD member store Revolution Bicycles in St. Petersburg, has a terrific quote in this Channel 10 news report on bike commuting. Bill points out that for the cost of a few tanks of gas you can buy a brand new bicycle. It's Bike Month, so ride your bike to work. I've done it for most of my adult life at jobs and it's worth the pedaling -- save gas, feel better and save a few bucks. This weekend included a couple of field trips to two wonderful parks -- Lettuce Lake County Park east of the USF campus on Sunday and Myakka River State Park about 10 miles east of Sarasota on Saturday. Lettuce Lake Park a pleasant, lush and scenic park off Fletcher Avenue about three miles east of the USF campus. Good bird watching and a terrific boardwalk that takes you inside some excellent vegetation and trees.